It has been a very exciting and busy few weeks for us, with the wedding season now in full swing and with the many fantastic wedding shows we have recently attended displaying some of our new wedding cake designs for 2013. Last week saw our SugarBliss wedding cake students finishing their 3 tier wedding cake designs in their final lesson At the Sugarbliss Cake School and we think you will agree, how absolutely beautiful their wedding cakes are. This week has also seen some new products arriving at our Sugarbliss Cake Decorating Shop here in Knowle, Solihull. The double piping bag by Culpitt is especially useful for creating those amazing double coloured butter cream swirls for perfect and stunning wedding cupcakes. Our new extra large 75mm wired sugar flower roses available in white, ivory and light pink our ideal to adorn any tiered wedding cake or to add that final finish on any celebration cake. 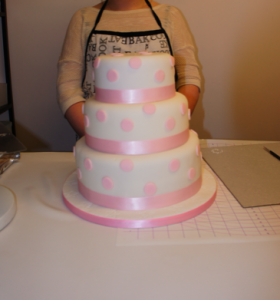 If you would like more information about our cake school or classes, please contact us. 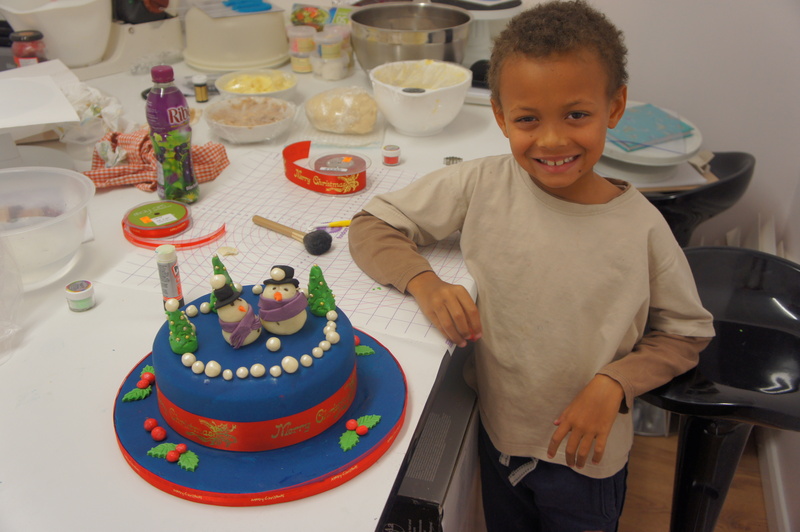 Last week saw the start of our very popular children’s cake classes held in our newly built cake decorating studio and running every week throughout the school summer holidays. In our 2 hour cake class, children from the ages of 6 plus can learn all the skills that we use, to create their very own cupcakes to take home. 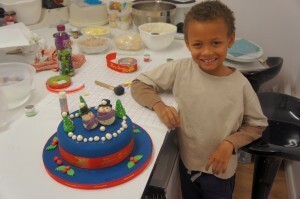 We also cater throughout the year for children’s cake parties. 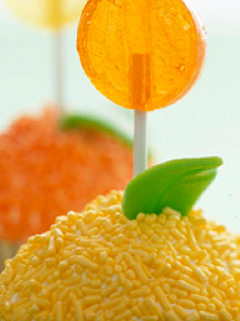 In our cake party class, children can celebrate their special occasion with their friends learning all the skills and techniques on how to create four fantastic cupcake designs. Not only do the children have great fun creating the cupcakes, they also get to take them home afterwards to eat them! The 2 hour children’s cake party class costs £15 per child which includes all ingredients and tools to create their four fantastic cupcakes. Children’s party classes can be booked at various times throughout the day, early evening and year to fit in with your special days events. If you would like any further information please complete our contact form or pop into our sugar craft shop situated on knowle’s high street, Solihull or call us on 01564 774 223. Are you thinking of having a tea party in the garden or a stylish dinner party maybe? 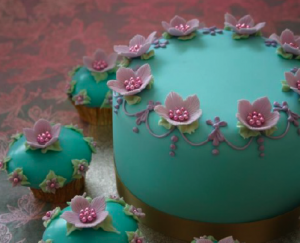 At SugarBliss Cake School you can create a centre-piece for your celebration – surprise your friends and family and learn how to recreate this vintage style cake which is decorated with beautiful sugar flowers and stunning piping detail. 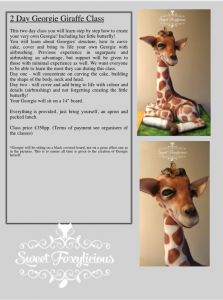 You will be working on a real cake which is all yours to take home on completion of the course. You also have a choice of flavours! Moist Victoria Sponge, Luscious Lemon Cake or Rich Chocolate. 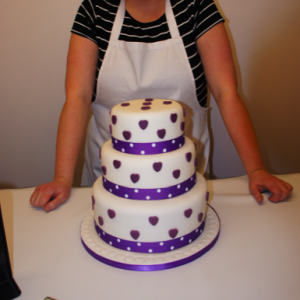 Places are limited to 6 – to book a cake class or to find out more about our Cake School please contact us. 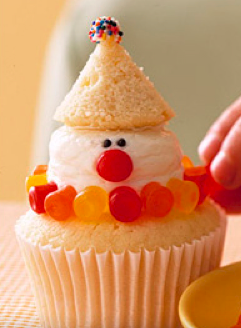 *please note that cup cake covering and decoration will be taught on a separate course – please keep a look out for our upcoming Cupcake Classes. Learn at SugarBliss Cake School how to recreate this sugary sweet and dainty cake which is decorated with beautiful sugar roses and rose buds, pearl brooches and both satin and sugar ribbons. 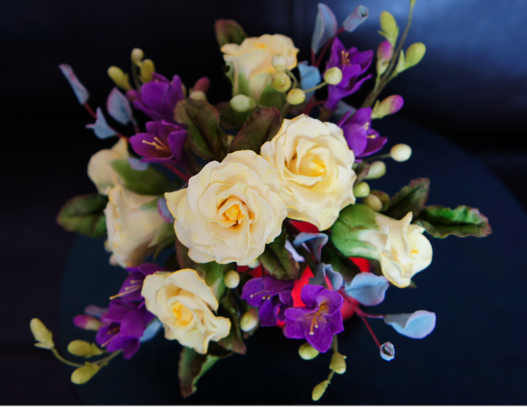 As well as weddings, this design is also very popular for engagement parties. You will be working on a real cake bottom tier and two top dummy tiers which is all yours to take home on completion of the course. 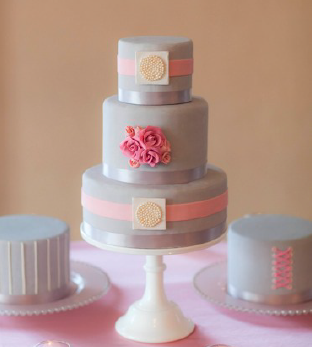 You will learn how to fill, crumb coat and ice a cake to give a perfect finish, how to create support between the tiers and how to create the individual adornments to decorate the cake.